Willis goes through the law favoring the right to terminate an attorney pro tem that was appointed at the request of his predecessor (John Roach). He requests the termination "to avoid the appearance of impropriety and to preserve the public’s confidence in the fairness of this prosecution." He goes on to explain that recently filed documents by the attorney pro tem’s (Assistant Attorney Generals Harry White and Brian Chandler) accused Judge Wooten of initiating an FBI investigation against former DA John Roach, and the attorney pro tems themselves. Based on this accusation, this would mean that White and Chandler are not disinterested and have a stake in trying to convict Judge Wooten. Basically, if they convict Judge Wooten, it would justify their investigation, and clear their own names in their federal investigation. This would be in conflict of the prosecutor’s duty to see that justice was done. 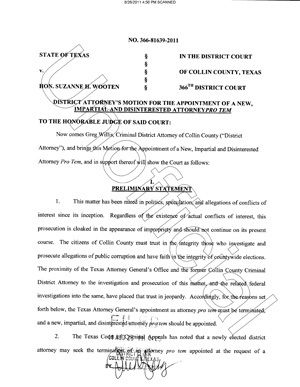 John Pitchford, of the Collin County Observer, wrote a recent article, No Speedy Trial for Judge Suzanne Wooten, which talks about the latest on this case, along with detailed coverage of the back story. I do find it amusing that this motion is "State of Texas v. Hon. Suzanne H. Wooten" in the header. I’ve never seen a prosecutor refer to a defendant as "Honorable." Yes, although that is the proper way to address a judge it seems out of place. But then again, I’ve never read documents on a Judge indicted under suspicious circumstances.